Kids that enjoy reading will have a lot of fun with this one. 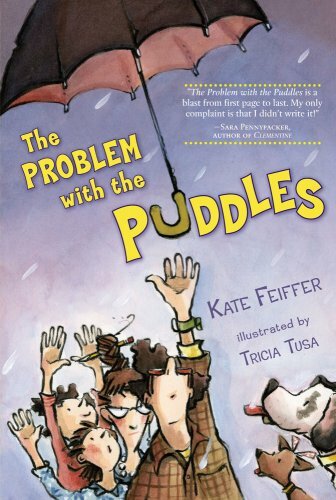 Kate Feiffer has developed a story jam-packed with entertaining word play. She has done a great job of providing an endearing tale of a dysfunctional family. Mr. and Mrs. Puddle can not agree on anything — not even their daughter’s name. Mrs. Puddle calls her Emily and Mr. Puddle calls her Ferdinanda, but she is known to the rest of us as Baby. You might believe that this is in actual fact the problem with the puddles. You’re not wrong in assuming so, but the problem in this story is that they have lost their dogs who both happen to be named Sally. You guessed it, Mr. and Mrs. Puddle could not agree on names for the dogs either. The twists and turns of the story lead to a surprising and happy ending. Every day clouds zipped across the sky until they got to the Puddle property. No one knew why. All anyone knew was that when a cloud did get to the Puddles’ house, it stopped. It took time out of its busy schedule to hang out for a while and practice its shape-making. It was as if the cloud suddenly forgot it was heading to a hurricane in Florida or an important blizzard in Canada. Perhaps it knew a family named Puddle lived below, or perhaps, as Baby Puddle believed, there was a big sign in the sky above their house that said STOP FOR PUDDLES.